On June 28, Jon Schafer, known in U.S. nordic circles as Fast Big Dog (FBD), stepped foot on Eagle Glacier, 5,700 feet above Girdwood, Alaska, where he spent about a week training on snow with a masters camp, led by Alaska Pacific University Head Coach Erik Flora. 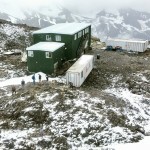 It was FBD’s first journey to the glacier and in the following account, he explains its significance. Interviews were conducted in person and on the phone. In just a few weeks, overweight and overpaid NFL players will assemble for training camps, subjecting themselves to the rigors of almost 60 total minutes of daily exercise. Each spring, Major League Baseball prepares its aging demographic of viewers for the tediousness of watching baseball with an even more tedious primer known as spring training. Elite rowers have long escaped ice-jammed winter rivers for a few weeks of cranking out miles in the Florida sun, and the list goes on and on. The offseason training camp has been a staple for top-level athletes in many sports for decades, providing a distraction-free environment for individuals to focus on sport-specific training, make technical improvements and provide the mind a much-needed break from the grind of offseason training. Nordic skiing is no exception. Nordic skiers have historically been very creative in their attempts to get on snow in the summer. European-based skiers have a few different options of glaciers and more recently, even ski tunnels. But what about North American athletes? What options are available to them? Is it necessary to make the pilgrimage to the tradition-laden glaciers of Europe or are there alternatives here in the U.S.? The answer is hiding in plain sight. 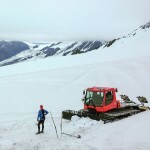 One of America’s premier Olympic development centers, the Alaska Pacific University Nordic Ski Center (APUNSC), has been taking skiers up onto Eagle Glacier in Alaska for over two decades. What began as three very hardy skiers living in a tent on the glacier has grown into one of the world’s top nordic ski training facilities at the Thomas Training Center. This transformation wasn’t easy though. Alaska can be a cold, harsh environment and the development of the elite facility that exists today only happened thanks to thousands of hours of dedication spread over more than 20 years by driven, committed people with a vision. In many ways, Eagle Glacier is much more an outstanding training center; it is also an excellent metaphor for the ascension of U.S. skiing as a whole. Both journeys have been tumultuous at times, with great success only coming after countless hours of hard work, commitment and teamwork. Probably not coincidentally, one of the most frequent visitors to Eagle Glacier is also one of America’s most successful skiers: current U.S. Ski Team (USST) member, four-time Olympian, three-time overall Sprint World Cup winner, and team sprint world champion Kikkan Randall. With these humble roots, a solid foundation was laid for growth and success. As a whole crop of young talent began to mature on the World Cup circuit, so did Eagle Glacier. “So many people worked hard to make that place what it is today,” Randall continued. “I don’t know if I’ll ever be able to express all of my gratitude to the people who first got it started, Jim Galanes and then Erik Flora in particular, whose efforts in the last ten years have been nothing short of extraordinary. Olympic gold medalist and nordic-combined world champion Billy Demong agreed. ”In the late ’90s and early 2000s, we were all working super hard, but we hadn’t quite broken through,” he said. “I was on Eagle Glacier in 2002 because as a team we were committed to be the best. Johnny [Spillane] won the World Championships the next year in nordic combined and that was really the start of our run. As Eagle starting getting more traffic from elite skiers, its mystique also continued to grow. For four-time Olympian Andy Newell, his first visit was the same year as Demong’s and his recollections were somewhat similar to both Demong and Randall. If that had been the end of the story, the trip may have not been all that memorable, but what followed is just one of many examples of the aura of Eagle. In contrast to Randall and Brooks, Newell, a Vermont-based skier with the Stratton Mountain School T2 Team, didn’t witness the slow, steady progression of the training center firsthand, as he didn’t have the opportunity to return to Eagle until last year, but he echoed all of the same thoughts. Some of the newer members of the USST immediately picked up on that vibe on their first visit. “I went up to Eagle for the first time two years ago and I was immediately awestruck,” remarked Olympian and 2015 World Championships bronze medalist Caitlin Gregg.”I had heard lots of horror stories from the old days, but as soon as I arrived I knew the place was special. 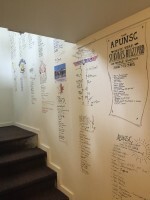 You see the names of all of these great skiers on the wall and suddenly it hits you, I am a part of this. Trouble viewing video above? Click here.